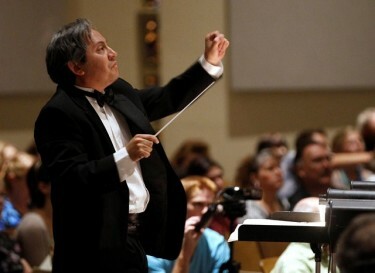 Each year, as Dr. Juan Hernandez, director of Grand Canyon University’s music department and assistant dean of its College of Fine Arts and Production, is planning the kind of music that vocalists and instrumentalists should perform at major concerts, he goes straight to the Bible. Music that exists to do just that, in the praise and worship of God, will be performed at GCU’s Masterworks Concert II, beginning at 7 p.m. Thursday at First Southern Baptist Church of Phoenix, 3100 W. Camelback Road, on the southeast side of campus. The free event will feature about 100 student performers in the Canyon Chorale, Canyon Singers and Critical Mass, in addition to faculty and student soloists, performing traditional choral repertory. They will be led by Hernandez and GCU vocal instructor Dr. Sheila Corley and accompanied by veteran pianist Mark Fearey. The feature work is English composer Benjamin Britten’s “Rejoice in the Lamb,” a cantata for choir, soprano, mezzo soprano, tenor and baritone soloists and keyboard. It is based on the poem, “Jubilate Agno,” which English poet Christopher Smart wrote while he was confined in an asylum. The words depict praise and worship of God by all created beings and things in their own way, Hernandez said. GCU’s choirs also will present a rich variety of music representing several centuries of music. “As always, there will be something for everybody,” Hernandez said. For more information about the event, call 602-639-8880 or email ethington@gcu.edu. Employee holiday, no ground classes.